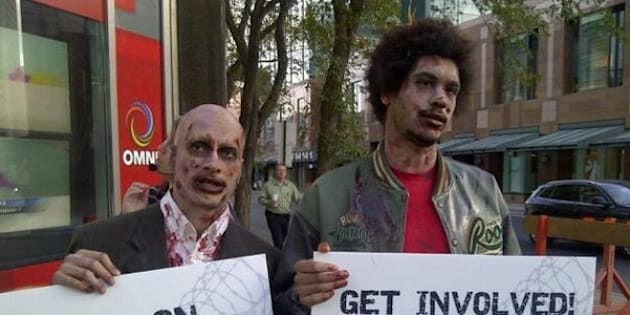 An election campaign pushing to build a zombie-proof wall around Edmonton couldn't sign up for the ballot because the zombie candidate was dead. Yuri Wuensch, the man behind the campaign, joked the mock candidate couldn't add his name to the race on Monday because he was "denied eligibility on account of being dead." Wuensch says while the group never intended to run for office, the goal of the stunt was to raise awareness of key campaign issues. The undead publicity stunt, Vote Zombie Wall, is aiming to make sustainable urban development part of Edmonton’s campaign conversation. It jokingly proposes the city build a wall around the city to keep zombies out – with deeper meaning that a wall could also stop suburban growth. The 41-year-old Edmonton native says he has been concerned about the city's urban sprawl for a long time. "Really, it started out as a bit of a joke," he said of the campaign, which has been two years in the making. Citing David Gordon, director of the School of Urban and Regional Planning at Queen’s University in Kingston, the group says Edmonton is failing to meet its own development targets. From 2006-2011, Gordon found 86 per cent of all population growth in Edmonton was in the suburbs with infill and other growth accounting for 14 per cent. Edmonton's municipal plan set a minimum target of 25 per cent infill, referring to downtown and already existing mature neighbourhoods instead of population growth in suburbs. "Edmonton could be a much cooler and more sustainable, affordable place to live," says Wuensch. The group also issued a sustainability questionnaire to all council candidates to help voters make their decision.